This loan can be referred to in a variety of ways on college financial aid letters ... which just adds to the mystery. The Stafford Loan is a federal student loan offered by the U.S. Department of Education for eligible students to help cover the cost of higher education. You may see this loan referred to as a Federal Stafford Loan, a Direct Student Loan, or a Direct Stafford Loan. The good news: they all mean the same thing. How does a subsidized Stafford Loan work? If you qualify for a subsidized Stafford Loan, the federal government makes your interest payments while you're in school, which can save you thousands of dollars. There are maximum limits for subsidized loans that are lower than the limit on unsubsidized loans. So, while it’s great that the government is helping you out with the interest payments, the amount you're eligible to receive in loans may not be enough to fully fund your education. How does an unsubsidized Stafford Loan work? If you can't demonstrate financial need, you will likely be offered an unsubsidized Stafford Loan. Even though this loan is part of the federal government’s loan program, they do not help you out with the interest. In other words, you will be responsible for the interest payments while in school. But you do have a choice about how you want to make those payments — you can either make the interest payments while in school or put them off until you leave. Just know that skipping out on the interest-only payments will add thousands of dollars to the overall amount of the loan. You will need to start making payments on your Stafford Loan six months after you graduate or after you leave school or drop below half-time enrollment. See also: Subsidized vs. Unsubsidized Student Loans: What's the difference? How much can you get from a Stafford Loan? The Stafford Loan has limits on the amount of subsidized and unsubsidized loans you can receive in an academic year. The loan amount limit also changes depending on the year of school you are in. For example, if you are a first-year undergraduate student, you may be eligible to borrow up to $5,500, but only $3,500 of that may be in subsidized loans. In addition to academic year loan limits, there is also an aggregate loan limit for subsidized and unsubsidized Stafford Loans. The aggregate limit is the amount you're allowed to borrow during your undergraduate or graduate academic career. For dependent undergrads, the aggregate limit is $31,000—with no more than $23,000 in subsidized loans. 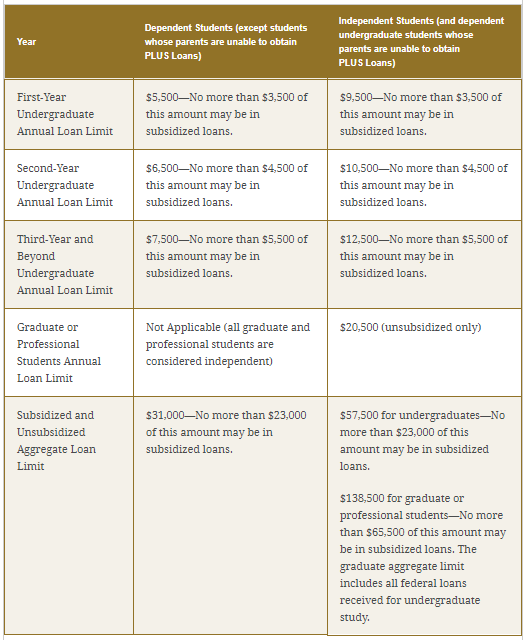 This chart from the U.S. Department of Educations shows loan limits. It’s important to note that your school determines the loan type and actual loan amount you are eligible to receive each academic year. Do you qualify for the Stafford Loan? The short answer: probably. Nearly every U.S. citizen qualifies. However, there are some limitations. First, you must be enrolled at least half-time at a school that participates in the Direct Loan Program. If you can demonstrate financial need, you may be eligible for a subsidized Stafford Loan, which means the government will cover your interest payments while you’re in school. This loan is only available to undergraduate students. If you cannot demonstrate financial need, you may still qualify for an unsubsidized Stafford Loan. This loan is available to both undergraduate and graduate students. If you’ve exhausted all of your federal financial aid options and you still need more money to pay for college, you may want to consider applying for a private student loan. And if you’re not sure where to start, download our guide Private Student Loans 101, to learn more.